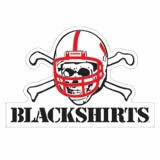 For those that don't know and/or aren't from Nebraska, here's the Nebraska Blackshirts logo for the defense. 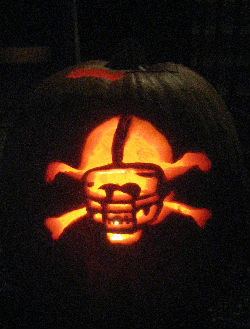 Last year, the Huskers played Baylor on Halloween, so I decided to create my first Husker pumpkin. 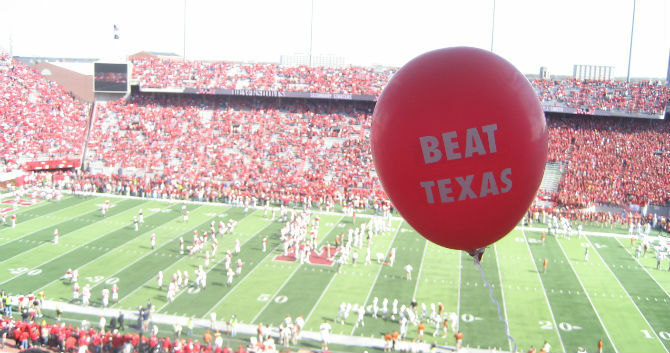 This year, Nebraska plays the day before, so I upped the ante a little and decided to go with a tougher challenge. Plus, there are bones involved, so it's much more appropriate for Halloween. I'm really not sure if I want to do an even more challenging one next year, but I at least want to try to keep up the tradition of sticking with the Husker pumpkins while I'm out here. This year we had Ben and Patty over to carve pumpkins with us. Everyone's turned out good in their own right. From left to right: Patty, Ben, Christi and Brian.